The best way to ensure that you and your family are eating a healthy diet is to prepare your own food and eat at home. This can seem a daunting task when thinking about the prep work involved in home cooked meals. The tools listed here will help alleviate some of that work by doing some of the heavy lifting for you (chopping, blending & zesting). You’ll have dinner whipped up faster than you could choose something off a takeout menu and have it delivered. 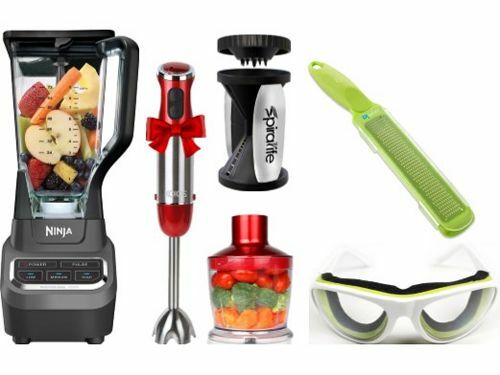 Here are 5 of my favorite kitchen gadgets for making eating healthy an easier and more enjoyable task. 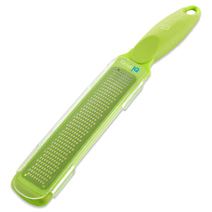 Give them a try for chopping, zesting, spiralizing, and keeping your eyes tear-free whilst peeling onions. The immersion blender with combo mini food processor is my number one “go-to” item in the kitchen. This thing does everything short of picking up your dry cleaning. Well, at least it seems that way. It’s a definite time-saver. Making a soup? Use the food processor to chop the veggies and when the soup is ready, just immerse the blender in the stockpot and blend away. No more spending loads of time hand-cutting vegetables and dealing with the mess of trying to transfer hot liquid to a blender, which always seems like a recipe for 3rd-degree burns! Most units come with a whisker for eggs, and a beaker for making smoothies and the like. I haven’t found much use for those attachments, but you might. Second in command is my high-speed blender. I have a Ninja, which isn’t as powerful as a Vitamix, but for the price difference I’m ok with that. 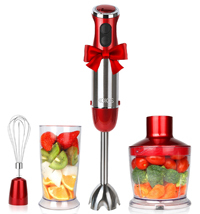 It can liquefy nuts, ice & frozen fruit fairly quickly which makes it a great tool for whipping up smoothies and nut milks. If you have kids that don’t love veggies a high-speed blender may be your ticket for sneaking some greens into their diets. Toss some spinach into a tasty smoothie and they’ll never be the wiser. Clean up is minimal as the blade comes out for safe and easy washing of the unit. 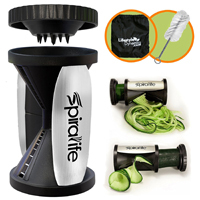 Rounding the bend and coming in at #3 is a handheld vegetable spiralizer. This little beauty can take a whole zucchini and turn it into zucchini noodles faster than a quick commercial break. I have only used the handheld spiralizer on zucchini and carrots, but I believe it would also work with other slender vegetables. If you’re interested in making noodles out of veggies of all shapes and sizes you may want to up your game and buy a more robust larger model. Vegetable noodles are a nice alternative to pasta and a cinch to cook and flavor. Just a few minutes on the stove, a little garlic, tomatoes and parmesan and you’ve got yourself a delicious, quick healthy meal. Holy smokes I thought I was immune to the ill effects of chopping onions until one day I took out my contact lenses before cutting an onion and discovered just how much oxygen those contacts were depriving my poor eyes of. I cried a river. 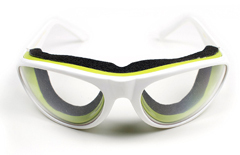 Enter onion goggles to the rescue. You will for sure not look cool, but you’ll save your eyeballs from excessive watering and pain. The onion can still get you if you remove the glasses and touch your eyes before washing your hands, so watch out. We’ll have to forgive the onion for its tear-inducing properties as its benefits far outweigh that negative. The onion is a great flavor enhancer and is also very nutritious. It’s high in Vitamin C, dietary fiber and folic acid. In addition it contains quercetin, a flavonoid that helps slow oxidative damage to the cells and tissues of the body. Lemon & lime zest can add scrumptious flavor to dishes and as an added bonus the zest is particularly healthful. Lemon peels actually contain about 5-10 times more vitamins than the lemon juice itself. Needless to say, I like to use a lot of lemon zest in my cooking. To make things easier, I ready ingredients ahead of time and so the catcher comes in quite handy. I can zest up a lemon and just leave it in the catcher until I’m ready to use it. Previously, I would attempt to zest the lemon onto a plate with less than desirous results. Hit the easy button and get the catcher! There are many kitchen tools and gadgets out there that can lend a helping hand. These are just a few that I find make my life in the kitchen a little easier.